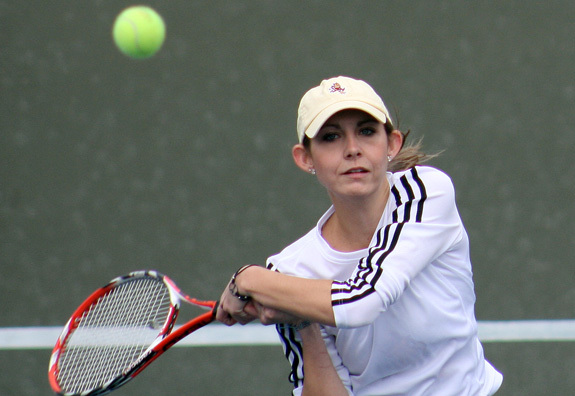 It was a tough way to earn second place and a spot at Nationals at the Tennis on Campus Championships-Southwest, but the Arizona State University Sun Devils ultimately found their way to the finish line, albeit a little soggy, a little road-weary and a little worn out. The TOC players endured three days of team play as well as two extra venue changes before ultimately ending the championships at Tucson Racquet Club in Tucson. The event, originally slated for Scottsdale Ranch Park in Scottsdale, Ariz., was rained out after one round of play on Saturday and a near total-washout on Sunday. The event was moved to Tucson’s Reffkin Tennis Center on Sunday afternoon, as rain showers stalled over Phoenix, leaving not many options for getting in the tournament before the weekend concluded. 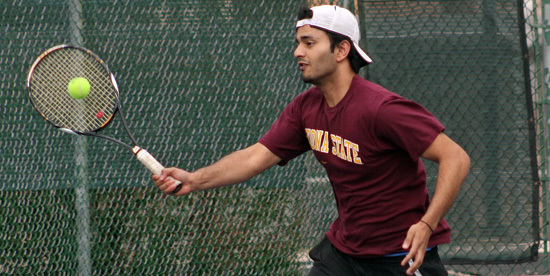 ASU, the third seed, had rolled through three rounds of pool play, giving up just 19 total games in the World TeamTennis-stye format of play (30-1 win over Northern Arizona team 2, a 30-2 over New Mexico team 3 and a 28-16 win over UofA team 2). In the semifinals in Tucson, the Devils No. 1 squad lost a close match-up to their rival, University of Arizona by a score of 27-25, winning the women's singles and doubles lines. Both semifinal matches began at the Reffkin Tennis Center around 2:30 p.m., but the event wasn’t completed until around 5 p.m., after a storm front moved through Tucson, causing yet another change of venue, this one to Tucson Racquet Club. The all-University of Arizona final wasn’t played due to weather, and the fact that both Arizona squads had made the final. Arizona State claimed the other automatic bid (since Arizona could not take two bids), after UTEP forfeited. The three-day event included several other schools, including University of New Mexico, New Mexico State University, and Northern Arizona University. Those schools split their own squads to make out a 16-team field. Both Arizona and Arizona State will now advance to the Tennis on Campus National Championships, which will be held at the Cary Tennis Center in Cary, N.C., April 7-9. A special thanks goes out to the staff at Scottsdale Ranch Park for assisting with the drying of courts on Sunday and for the use of their venue, as well as to the Reffkin Tennis Center and Tucson Racquet Club for accommodating the tournament. Without your assistance, we most definitely would not have completed this year’s event. Also, a special thanks to All About Tennis, for contributing player gift certificates to the store for the event. All of it was much appreciated! Semifinals: Univ. of Arizona1 27, Arizona State1 25; Univ. of Arizona3 25, UTEP1 18. Third place: ASU wins via forfeit from UTEP.